Stars Above is a delightful second floor holiday apartment, full of character and charm, situated in the village of Hinderwell between the pretty coastal resorts of Staithes and Runswick Bay, and an easy drive from the historic town of Whitby. The apartment is part of a larger property with a bistro on the ground floor, which is perfect for enjoying a spot of lunch or evening meal or one of the many themed nights. Access to the apartment is on the ground floor with five steps leading to a shared lobby and another flight of fairly steep stairs into the apartment. There is a delightful shared garden full of flowers with seating made from re-claimed materials which offers a relaxing, tranquil space to enjoy in the summer. The apartment is full of character and charm with sloping ceilings and wooden beams (with restricted heights in certain areas) as well as tasteful decor and furnishings throughout. 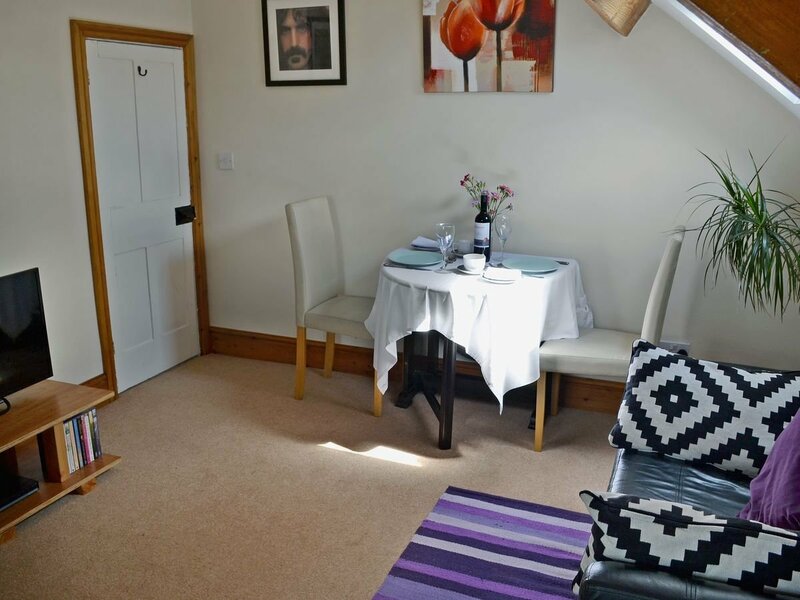 It provides a high standard of accommodation for couples looking to explore this beautiful coastline, boasting of views over Borrowby and Roxby Dale. It is also ideal for those who enjoy outdoor pursuits, with an abundance of footpath and cliff walks in the immediate area, including the famous 110-mile Cleveland Way, where you can walk along the cliff tops and enjoy the stunning scenery to the quaint fishing village of Staithes, Runswick Bay, Sandsend and then on to the bustling fishing port of Whitby. Whitby itself is an excellent day out, where you will find plenty to do with an abundance of attractions to suit all ages, along with an excellent selection of shops and cafes in both the new and old towns. From Whitby, a ride on the steam train is not to be missed and from which you can view the dramatic scenery of the North York Moors en route through the quaint little villages of Grosmont, Goathland (alias Aidensfield in the TV series ’Heartbeat’) and Levisham to its final destination of Pickering. The beautiful Victorian resort of Saltburn is only eight miles away with its own cliff lift dating back to 1884 and famous pier which is the most northerly surviving British pier and Smugglers Heritage Centre not far from the lovely promenade is perfect for a leisurely stroll on a fine evening. Be the first one to tell us about your rental experience while staying at Stars Above. Let us know if the listing matched your expectations. You can share your comments about the location, property owner/manager and all the unique features that made your stay a memorable one.